Thrifty By Design: Finishing projects so you can start more! I have a fire in my belly so to speak. I want to get a few projects done, without getting distracted of course, so I can move on to more projects. Right now I'm focusing on furniture since I can work on those pieces outside while the warm, dry weather is with us! I picked up this vintage lamp at the Salvation Army for $3 yesterday. It's in great condition except for the horrible painting job someone did on the lampshades. I was able to remove most of the paint using rubbing alcohol oddly enough. Once I was able to remove most of the paint, I noticed one of the shades is a bit burnt. I've decided this week I'll pick up some rice paper and decoupage the shades. I think this should work well and will be in keeping with the funky vintage vibe. 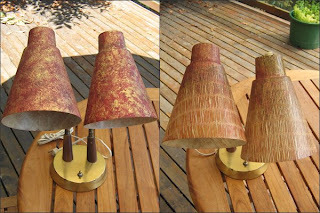 Two things that blow my mind these days: people who destroy kewl vintage items and the use of shellac. Shellac is not my thing when you're refinishing a piece. Usually I buy shellac-ridden pieces then curse them as I try to remove the finish. While I wait on the rice paper, I moved onto one of the two trays I'm refinishing (the other tray is the notorious craft disaster piece - I'm not sure I'm ready to go back to it yet). 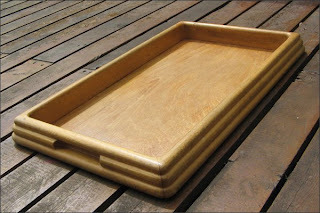 I sanded this tray today. I picked this tray up at the Salvation Army as well for $5. The wood is super nice so I contemplated staining it but the style shouts out for paint and definitely either a paper or fabric lining on the inside. Today I'll prime it then it'll be ready for later in the week when I have time to finish it off. 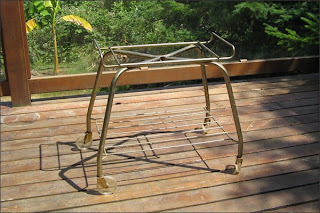 Another piece I bought at the Salvation Army is this stand. It was $2.50. This week I'll measure the top and search out an option for the top shelve - either a tray or glass piece to sit on top. I won't have to do much to make it more functional. Next weekend I'll be sanding like crazy! I have a few things to finish off then I can be ready to work on the teak chairs we want to refinish and reupholster. We have 6 chairs that we bought for $50. I have free fabric for them. I'm a bit scared by the task of taking them apart then putting them back together again. I'll get a few more successes under my belt then work on the chairs.